Northeastern Yap. The peninsula to the left is part of Gagil province, with Gachpar (Gachpar in Yapese) village just down the coast, to the left out of the picture. The sawey relationship is in fact a powerful and wide-ranging interconnection between not just Yap and Ulithi, but among all the islands of Yap State and beyond into what is now Chuuk. It is the bond that ties these islands together as more than just neighbors. “Yongl’aab fed Filtey and sent him back to Ulithi,” Pitmag says. “And Yongl’aab promised him, ‘when you get to Ulithi and you come back some time to visit me.’ So Yongl’aab gave him something: ‘Make sure when you come back from Ulithi you bring something to me.’ That’s the beginning of the sawey. “After Filtey, they used to come to Yap bringing dried fish,” Yaad adds, “because at that time, we didn’t have salt, so they dried it under the sun. No salt. They just dried it and brought it to Yap, and then we exchanged with food, because they were really poor of food. And that’s the beginning." Canoes from Ifaluk. TTPI Archives photograph. “And after that they used to bring coconut fiber and lavalava, copra candy, copra oil, and coconut rope. And we used to give them food, turmeric, baskets made by Yapese women (which is different from what they used to make). At this time, we used to give them thuw, which the men used to wear. “Now we have many things we used to exchange like this: liquor, and rice, ramen, coffee, like before only certain things because we were really poor at that time. So here is how the sawey began." "Sawey is a name of a basket" says Stanley. "When we go fishing with line and pole, the sawey is a basket you put under your neck, hanging on your chest, so when you get a catch, you just bring the fish in, then you kill the fish right inside the basket hanging there. That’s the name for this relationship, because it’s where you collect what you catch, and you come home with a full basket. So on Yap, we carry the basket and they fill it up; you empty it and they fill it up more." “The sawey basket came from the term sawey,” Yaad states. “And meaning of sawey is ‘he left,’—as on a trip or a journey. Wey is a Ulithian word, ‘left on a trip.’ Sawey is a traveling. And they used that term sawey for the basket, because that’s the basket that went between us. 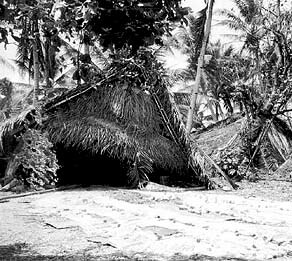 When they come to Yap they used to take it around, from house to house in Gachpar and Wanyaan and Riken—these are the only three villages have sawey for the Outer Islands. Gachpar is the biggest. 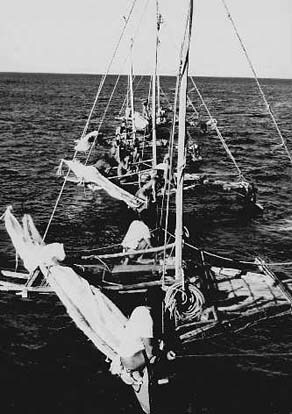 “They filled the basket in the Outer Islands, because at that time, there is no suitcase or anything. They used to fill the basket with Fais tobacco, and lavalava, coconut candy, coconut oil and also coconut rope. That cannot fit in the basket, but it’s a part of the basket." 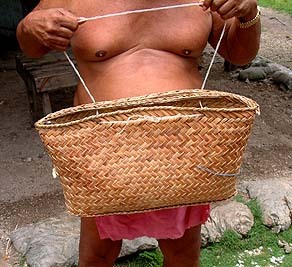 Chief Yatch demonstrates the kind of basket Outer Islanders are supposed to carry while on Yap. "And they bring the basket to Yap and give it to Chief, and the Chief wants to fill the basket again, and give it to them. So when they depart on their way back, we give a basket of food. 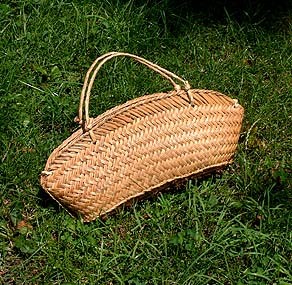 It’s a part of sawey, part of the basket. And also some special things from Yap, including canoes. Canoes cannot fit in a basket. And turmeric, a yellow powder. "A lot of things we give them. They give us a little and we give them more, because they are from a small island and we are on a big island, so we always want to help them. “The sawey is not like a friend; it’s the relationship between a Ulithian and us. Each house platform here has their own sawey on a house platform out there. Sawey is not like the people walking down the road and stop by and we give them something; oh no. That’s a friend, yes, and sometimes we do that. But the sawey connection, that’s not the way it works. And these sawey connections, not just Ulithi but all the way out to Chuuk." “Gachpar gave us the authority, the responsibility, for the other Outer Islands up East," Stanley says. "The chain of command was given to us by the Gachpar people on Yap. There is one overall sawey for the entire Outer Islands, and there are break downs of that sawey into families and clans, but that one is overall. That sawey gives the authority to us to represent Gachpar—it’s not all of Yap." "And then we give Fais the authority to oversee what’s going on on Fais, and then we give authority to an island named Wottagai in Woleai Atoll. And the next to Lamotrek, and then after Lamotrek we give it to Puluwat." "That’s the 'chain of command': Gachpar, Mogmog, Fais, Wottagai, Lamotrek, and Puluwat. These were all connected." The sawey relationship places Outer Islanders in a distinct position within Yap's social structure. "We have three P's," Yaad explains: "First P is Pilung. That’s high caste. Second P is Pimlingay, which is the low-ranking villages. The third P is Pimthaw [Ultihian: piimdaaw], the Outer Island or oceanic people." "In Yap they have a caste system" Philip explains. "They have the lower caste, all the way up to chiefs; but the Outer Islanders are not a caste. They are not low caste, they are the ‘children’. "Our islands are very poor compared to Yap, so whatever we go, they call us piimdaaw, means ‘people of the ocean.’ ‘Those piimdaaw, give them some food’ and they will give us taro, we’ll put in our basket. When we come back, we have a full basket of food." "We were not supposed to go into the taro patch," Chief Yatch says. "When you went to your sawey, you'd say ‘give me some taro,’ and they are the ones that would go get it. It’s not taboo anymore. Nowadays, when we go there, they’ll tell us to go get the taro ourselves." 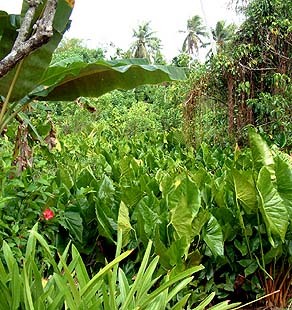 Taro patch in the Gachpar area. In Colonia, Yap, an Outer Island man is readily identifiable from his white thuw. "And the Yapese kind of basket, that one is kind of a taboo for Outer Islanders to use in Yap." “We are not allowed to carry the fancy Yapese kind of basket,” Philip agrees. “We only carry this kind that we call tangreg. But we are not low caste like certain Yapese. The low-caste Yapese cannot eat with the chiefs. But us, we eat with them, we go into their houses." “Red thuw, we Outer Islanders are not supposed to wear it in Yap,” Chief Yatch emphasizes. “We are Outer Islanders. We never wear that. That’s part of our custom, our culture. In Yap we wear blue or white thuw. We’re not supposed to wear shirt or pants either." "We don’t wear colored thuw on Yap,” Philip agrees,“we wear only white, so wherever you walk, they recognize you. They know, ‘oh that’s an Outer Island man'." "Nowadays you can see some Outer Island people are wearing the red thu around in Colonia, which is not so good for us to do" Chief Yatch says. "And you can see many people, Outer Islanders, wearing clothing to go to Gagil. It isn’t right, we are not supposed to do that, but nowadays , we’re learning little by little from Western culture." 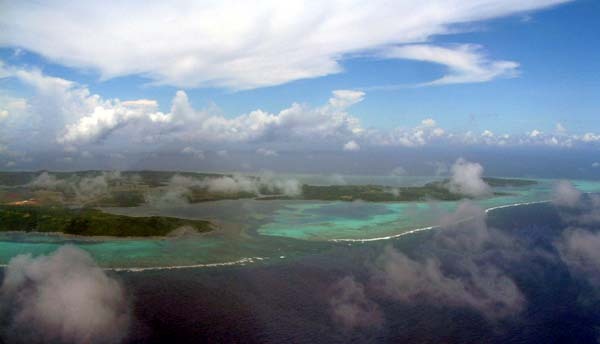 This connection between Yap, Ulithi and the other Outer Islands manifested most clearly in the Tribute Trips. See the link at the bottom of this page to view more about these trips. Ulithi also holds a special position in relationship to its immediate neighbors, Fais and Sorol. “While the Outer Islands sail to here,“ Barney says, “we Ulithians sail only from here to Fais and Sorol. That’s it.” Manuel adds, “We used to sail to Fais, visiting our relatives." “On Fais, they speak the same language,” Ignathius points out. “A little bit different, but we understand each other. We also get our tobacco from Fais. 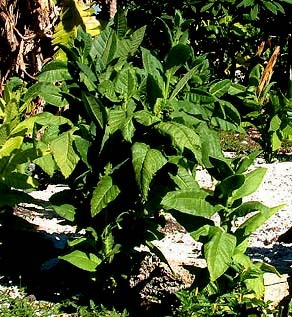 We grow some tobacco here, but not much, not like in Fais." 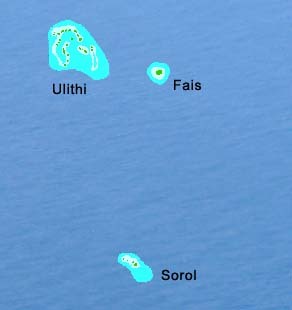 Sorol and Fais are nearby neighbors for Ulithi. “The Sorol people, we’re their sawey,” Stanley says. “So they are like children to us. We have to take care of them when they come here. They don’t go elsewhere, because the Legfaeliuy people on Mogmog are the people that are taking care of them. We own the island and we own the people; we own Sorol and we ‘own’ the people of Sorol." "So when they come here, they’re ours to look after. Like when we go to Yap, we are children to Yap, to Gachpar; we’re not like them. We’re all human, but the level of people that we go there, we’re like children." Isaac Langal explains more about Ulithi's relationship to the other Outer Islands: "We have relatives in Woleai, relatives and friends, classmate from high school. There’s a lot of what I think is inter-marriage from a long time ago. "So we have relatives there, and Woleai people have relatives here. The same with Satawal and the rest of the islands. Maybe that comes from the tribute trips, when they all used to have to come and stay here." "Typhoon damage: ruined homes, Sorol." After a typhoon is a time when people from Sorol might look to Ulithi for help. Photograph from the TTPI Archives. The "Trukese" language group of the central Caroline Islands, with its subgroups. Note that Yapese is not part of this language family. Despite the close proximity of Yap and Palau, Yaad states, "Yapese and Palauan are not the same. No, not close, some words are almost the same, but if you cannot speak Palauan, you can not understand the way they talk. If a Palauan doesn’t speak Yapese, when he talks you can not understand. Very much different." What happens when the people from Gachpar come out to Ulithi? "When they come out, they are the boss," Philip says. "They say they own this place. But somehow, we think it’s true because in the history of this place, our religion, they say that the first person here was that lady from Yap." We will learn more about the tribute trips and the relationship with Gachpar as we turn to the Native Place chapter.